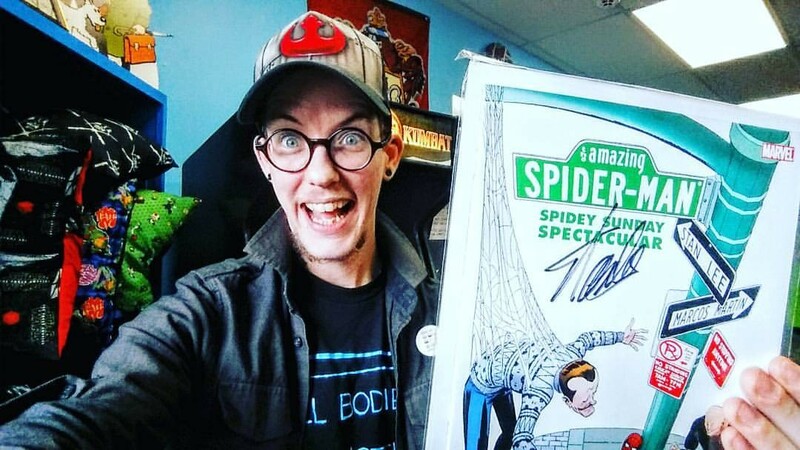 Jay Aaron Roy is the owner of comic shop, and youth drop-in centre, Cape & Cowl Comics & Collectibles (536 Sackville Drive), which celebrates two years in business this week. We chatted about lessons learned, the importance of a strong community and why the shop will never leave the neighbourhood. What is the biggest thing you’ve learned about running a small business? I think really I learned a lot about myself, actually. I don’t have a staff yet. I have great volunteers that help me, but I am Cape & Cowl. I learned a lot in the first year, and basically double that in the second. You’re just thrown into so many situations in which you have to be able to think on your feet. People know I’m a well organized person, but there are just some things you can’t plan for. I’ve learned a lot about myself that way. It’s incredible that after two years you’re still a one-person operation! I think that’s why I say I’ve learned a lot about what I can handle. I’m very tired, but I’ve embraced this. I have so much energy, I don’t where to put it…but this has been a really great energy sink. I’m a colourful, organized person and that’s what my store is—colourful and organized. You opened your business in Sackville, which is kind of off-the-beaten retail path. Why was the location important to you? And let me tell you I’m paying the same, if not more, in rent, monthly what someone would pay on Spring Garden Road or Barrington Street. Out here even if you don’t have the foot traffic everyday, you have a dedicated community that will gather around you—and that’s why Jennifer Welcher organized the cash mob [in February], because my landlords aren’t connected to what’s going on here, but my community cares. They help me survive and stay. Why is it important for you to stay in there, despite the issues with rent? What’s important to me is that it’s my community, it’s my rural area. I grew up in Fall River and was keenly aware there was nothing out this way. And by nothing I don’t mean literally nothing, I mean next to nothing. Every now and then something would pop up but nothing would stay, and I mean something for the youth to do. Other than the McDonald's and the library there's nowhere to go and do anything, and I wanted to provide that. That’s where my heart is. I also love comics and literacy, but where my heart is is connecting with youth, helping them find something that will get them passionate. A lot of youth are my consignment artists, and volunteers. What would you say has been your biggest challenge to overcome since opening? I guess just dealing with the Big Business mentality, that’s been my struggle. People know me I’m loud, transparent and fight for what I believe in and that’s been the struggle, trying to run my business and fight those fights at the same time. But I don't know, I love going to work every day to see those faces, and see kids playing Nintendo, or having a good time at their parties And the drop-in centre, seeing youth just hang out—I have over 43 volunteers and I’m on a first-name basis with over 50 local kids. I like being in my community, really. For me, I love being the maestro. At this point, there are so many people involved in consignment, volunteering, running events— I really feel like the facilitator. I get the final say and that makes me happy, but there are so many other people involved and it just wouldn’t work without them. Right now my battles with the landlord make it unknown if I’ll even be able to stay in the location I’m in, but whatever happens I will survive and Cape & Cowl will survive—I will find another location and the community will help me set that up. If we have to move anywhere, we’ll just be bigger and better, but we’re staying in Sackville, that’s for sure.